The average cost of assisted living in Crawfordsville is $3,390 per month. This is higher than the national median of $3,346. Cheaper nearby regions include Lafayette with an average starting cost of $3,152. To help you with your search, browse the 6 reviews below for assisted living facilities in Crawfordsville. On average, consumers rate assisted living in Crawfordsville 4.5 out of 5 stars. Better rated regions include Greencastle with an average rating of 4.6 out of 5 stars. Caring.com has helped thousands of families find high-quality senior care. To speak with one of our Family Advisors about assisted living options and costs in Crawfordsville, call (855) 863-8283. Crawfordsville, Indiana, only has three assisted living communities to serve the needs of its senior community, which makes up 17.8 percent of the city's 16,001 population. However, there are 10 more communities located in the nearby Lafayette area. The state's facilities are either designated as assisted living facilities or residential care facilities, but the only distinctions between them is that residential care facilities provide basic nursing services. Because of this, communities designated as assisted living facilities only need to file a disclosure form with the Family and Social Services (FFS) Division of Aging to remain compliant with state laws. Residential care facilities, however, are licensed and regulated by the Indiana State Board of Health Administrators. Sunshine Vans provides transportation for seniors age 60 and older on a donation-only basis. The service is operated by Crawfordsville Parks and Recreation Department and appointments must be scheduled in advance. Crawfordsville has an array of community resources for seniors, including the Area IV Agency On Aging and Community Action Programs, an organization that offers schedules regular day trips for seniors age 55 and older, including visits to Conner Prairie, the John Dillinger Museum, the Indiana State Fair, and Victory Field for an Indianapolis Indians game, as well as one senior center. The cost of living in Crawfordsville is slightly less than Indiana’s average cost of living. However, the city’s average cost of for health care and groceries is slightly higher than the state’s average, which may make it difficult for seniors to find affordable options. 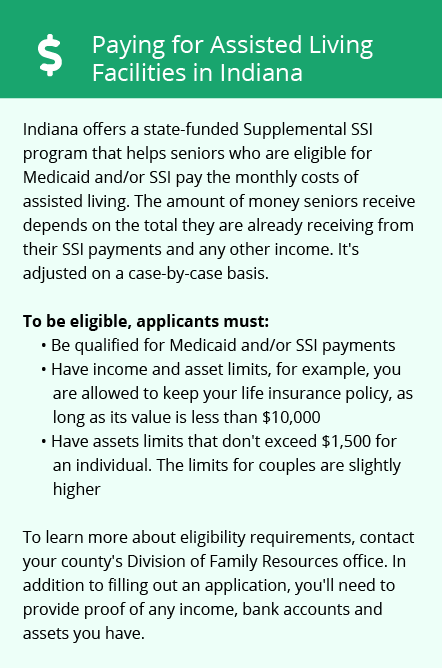 Indiana is moderately tax-friendly to seniors. Residents should expect to pay the full 3.23 percent tax on retirement account withdrawals and pension payments, but Social Security income is tax-free. The Crawfordsville area is home to world-class medical facilities, including Franciscan Health Crawfordsville, in the event of medical emergencies or illness. Crawfordsville has a crime rate that’s higher than 87 percent of Indiana’s cities and towns. When compared to other mid-sized communities, the crime rate in Crawfordsville for violent and property crimes combined is quite a bit higher than average. Assisted Living costs in Crawfordsville start around $3,390 per month on average, while the nationwide average cost of assisted living is $4,000 per month, according to the latest figures from Genworth’s Cost of Care Survey. It’s important to note that assisted living rates in Crawfordsville and the surrounding suburbs can vary widely based on factors such as location, the level of care needed, apartment size and the types of amenities offered at each community. 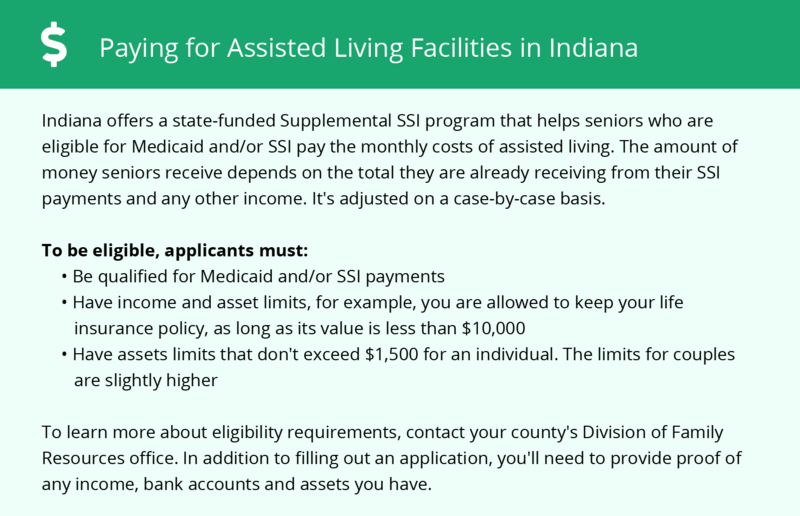 Indiana’s Regional Care Assistance Program (RCAP) helps seniors pay for costs associated with residing in an assisted living facility or a residential care facility. The state also has a Medicaid Waiver program that helps pay for RCF costs. Crawfordsville and the surrounding area are home to numerous government agencies and non-profit organizations offering help for seniors searching for or currently residing in an assisted living community. These organizations can also provide assistance in a number of other eldercare services such as geriatric care management, elder law advice, estate planning, finding home care and health and wellness programs. To see a list of free assisted living resources in Crawfordsville, please visit our Assisted Living in Indiana page. Crawfordsville-area assisted living communities must adhere to the comprehensive set of state laws and regulations that all assisted living communities in Indiana are required to follow. Visit our Assisted Living in Indiana page for more information about these laws.